When Geelong and Hawthorn met in the 2008 Grand Final, the fridge and sinks where The Crafty Pint watched the match were filled with Cooper’s and Mountain Goat. Twelve months later and the vastly different beer lineup in 2009 was a pretty fair reflection of how fast the Aussie beer scene was changing. 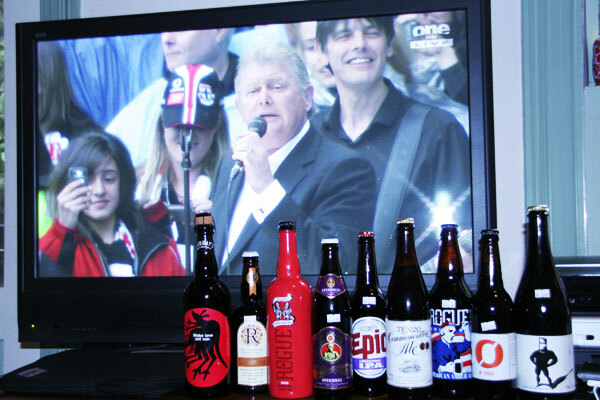 As John Farnham belted out You’re The Voice, homegrown brews like Bridge Road’s Imperial Porter, Murray’s Icon 2, Malt Shovel’s TEN20 Commemorative Ale and some Goat Hightail (when we needed to calm things down) were being lined up alongside some impressive beers from New Zealand, Europe and the States. Yet if The Crafty Pint beats the odds and snags a ticket for this coming Saturday, it’ll be back to a choice between Draught or Midstrength, Bundy or Cougar, coffee or water. Doesn’t really match up, does it? Given the chances of landing a seat at the G are wavering somewhere between zero and bugger all, it looks like it’s time to start planning the 2010 Grand Final beer lineup instead – this year from an even greater choice than before. So do we dive into the cellar to mark the special occasion or hit a bottleshop and splash the cash again (it was $92.50 on five beers at Slowbeer last year)? Or are we getting it all wrong – should this be the one day of the year when even craft beer lovers show solidarity with those at the ground, listen to the game’s sponsors and pick up a slab of Carlton? We know what we’ll be doing (unless we land that golden (black and white) ticket), but what about you? What’s your tipple going to be when the bounce comes? And is there a beer that represents Grand Final Day for you more than any other?